If you already have the Sony Xperia XZ2 Compact, and are thinking about bringing the device to Verizon, we have some good news for you. The nation's largest carrier has certified the handset for use on its network. If you don't already own the phone, you can purchase the unlocked Xperia XZ2 Compact from a retailer like Best Buy (where incidentally, the White Silver model is $50 off at $599 with activation today), bring it to Verizon, and it will work perfectly on Big Red's 4G LTE network. The Xperia XZ2 Compact carries many of the same specs found on the full-sized Xperia XZ2. It features a 5-inch LCD screen with a 1080 x 2160 resolution, and an 18:9 aspect ratio. Under the hood is the Snapdragon 845 mobile platform; 4GB of RAM is inside along with 64GB of expandable native storage (48GB available to the user). A 19MP rear-facing camera graces the back of the phone while a 5MP selfie snapper can be found in front. And yes, the 960fps slow motion feature is included. Keeping the lights on is a 2870mAh battery, and Android Oreo is pre-installed. If interested in bringing the Sony Xperia XZ2 Compact to Verizon, you can click on the sourcelink or visit your local Verizon store. 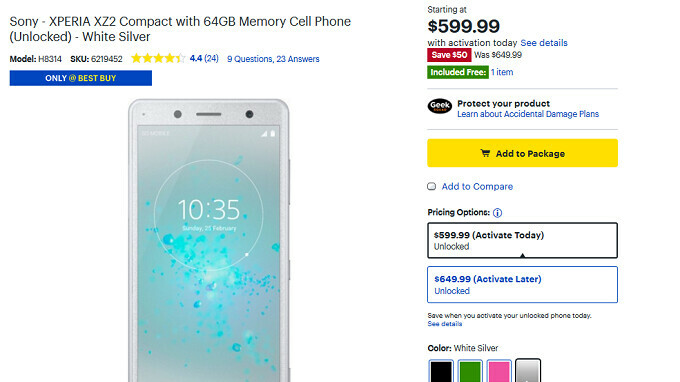 And if you need to buy the phone first, check out Best Buy to take advantage of the current sale. This XZ2 compact is physically smaller than an iPhone 8. Costs $100 less, has a larger and higher resolution display. It even has a higher resolution display (2160x1080) than an iPhone 8 plus. It has a HDR display which the only iPhone that has a HDR display is the iPhone X. This XZ2 can even record in 4k HDR, has portrait mode, and 3D scanning. The iPhone 8 cannot do any of that, and no iPhone can record in 4k HDR yet. Only an ignorant die hard Apple zealot would buy an iPhone over this XZ2 Compact. So why is the compact compatible but the full sized version isn't? It most likely is compatible, they just haven't certified it. So will it support carrier aggregation with verizons lte bands? To get faster speeds ? Like their newest phones do ? And will voice over LTE work?? I can't find anything on this on any other pages . If everything will work fine . And what about those places Verizon drops down to 1x or evdo ? Does this phone support them? I know a few stores deep inside my note 8 drops down to those 2. No lte at all makes it in there . But I can still call over 1x fine . I see this phone doesn't support that so I guess no service? It's nice to see that they took $50 off for this, but only for one color is kind of annoying. I can wait though for a deeper drop, especially when we also consider taxes as well to the final price.